Jean Baudrillard was one of the most influential, radical, and visionary thinkers of our age. His ideas have had a profound bearing on countless fields, from art and politics to science and technology. Once hailed as the high priest of postmodernity, Baudrillard’s sophisticated theoretical analyses far surpass such simplistic caricatures. Bringing together Baudrillard’s most accomplished and perceptive commentators, this book assesses his legacy for the twenty-first century. It includes two outstanding essays by Baudrillard: a remarkable, previously unpublished work entitled ‘The vanishing point of communication,’ and one of Baudrillard’s final texts, ‘On disappearance’, a veritable tour de force that serves as a culmination of his theoretical trajectory and a provocation to a new generation of thinkers. 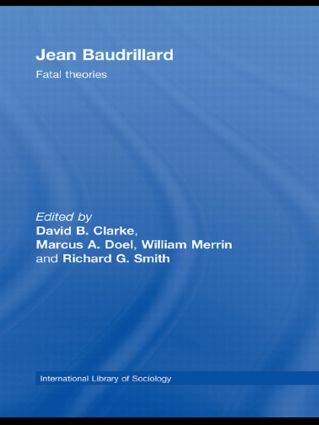 Employing Baudrillard’s key concepts, such as simulation, disappearance, and symbolic exchange, and deploying his most radical strategies, such as escalation, seduction, and fatality, the volume’s contributors offer a series of thought-provoking analyses of everything from art to politics, and from laughter to terror. It will be essential reading for anyone concerned with the fate of the world in the new millennium.